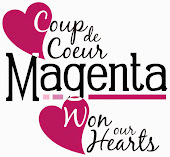 Hi it's Christine here at Magenta with a plant based background. You're probably wondering what that means. 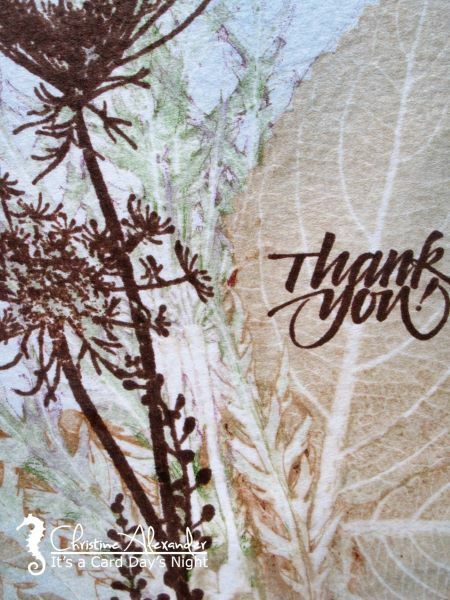 If you look carefully the leaf images are real plants pressed between two sheets of card stock in my die cutting machine. I use the plates for my thin dies, place the plants between the two pieces of card stock. I use Mixed media but as long as it absorbs water it will work. The water from the plant will squeeze out so you might have to wipe off your machine and the plates after but it's worth it. I also blended some distress ink (weathered wood) around the edges to bring the colours together. Bonjour, c'est Christine ici chez Magenta avec un arrière-plan à base de plantes. Vous vous demandez probablement ce que cela signifie. Si vous regardez bien, les images de feuilles sont de vraies plantes pressées entre deux feuilles de papier cartonné dans ma machine de découpe. J'utilise les plaques pour mes matrices minces, je place les plantes entre les deux morceaux de papier cartonné. J'utilise un papier média mixte, mais tant qu'il absorbe de l'eau, il fonctionnera. L'eau de la plante s'écoulera et vous devrez peut-être essuyer votre machine ainsi que les plaques, mais cela en vaut la peine. J'ai également mélangé de l'encre Distress ("weathered wood") sur les bords pour rapprocher les couleurs. Look at the beautiful print you can use as your background for your stamps. Regardez l'impression magnifique que vous pouvez utiliser comme arrière-plan avec les étampes. Wow Christine, what an amazing technique. Your card is gorgeous! You are amazing! Love this technique. The card is stunning. Stunning card Christine. I'll be out in my garden picking some leaves today to try this! Your cards are inspiring! Beautiful and love the background design too. Would also make a great sympathy card. What an amazing technique and a perfect background for these lovely wildflowers! Your card is stunning Christine. 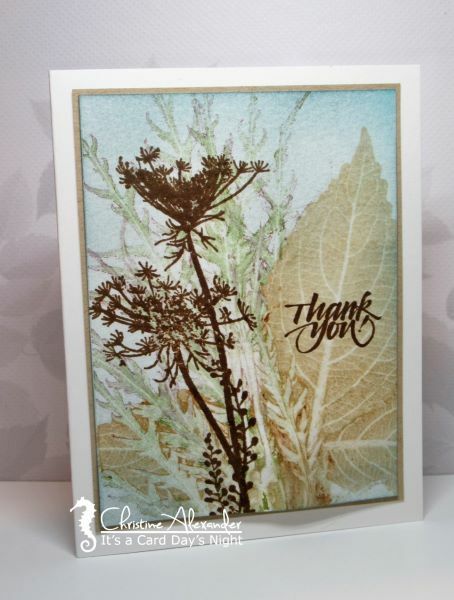 I love the technique and the stamp you paired with the background. What a beautiful background and a great way to do it. This made a simply gorgeous card. It is such a back to nature look and I love it. Great results from pressing the leaves, Christine! It created a perfect background for the wildflower stamp. This is amazing! I have to try it! Thank you, Christine! This is amazing, Christine! Your plant based background is simply stunning and perfect for the wildflowers. Love the wonderful colors and the detail from the real leaves. Thanks for sharing the technique! Wow...the most stunning effect and what fabulous inspiration, thank you x.